Our 40 page, full color Holiday catalog is personalized on the front and back covers to identify your store as the place to shop for toys. A small 4 page insert allows extra space for you to ‘talk’ to your customers, either offering more coupon opportunities or a place to advertise events and services. We are more than a fantastic holiday catalog! Consistent marketing drives business and we keep you in front of your customers all year long. With these seasonal catalogs, your customers will see your exciting cover that’s personalized with your store information, sixteen pages packed with toys and a great introduction to the season. 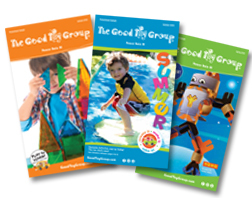 Each catalog has copy and design structured to meet the strategy of placing your store as the epicenter of good toys, service and product knowledge. Playful, colorful, informative; a perfect blend to drive business. Summer shopping brings its own set of challenges. Drive traffic to your store with a thoughtful and interesting program of summer activities. 10 planned activities are pre-selected, tested and structured to provide a summer worth of visits to your store. All the planning is done for you. The summer activity piece is 16 pages with 4 a page insert containing the schedule and products for the planned in-store activities. This insert can be easily pulled out to post in full view for the family. In addition, for those that do not want to do activities we offer a non-activity version. 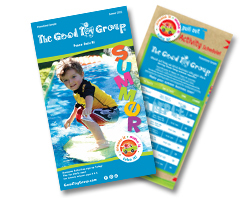 This version is a full 16 page summer catalog with the same format and product as the activity version without the insert. These summer catalogs showcase about 45 toys with the concentration on summer travel and outdoor play.